We flew into Cairns airport and hired cars for the short drive to Port Douglas around 1 hour. There are many flights in and out of Cairns from all major cities in Australia. Many people also use Port Douglas as a stop as they drive up or down the East coast of Australia. Port Douglas is one of many locations located along the North-Eastern coast line of Australia that runs parallel to one of the 7 Natural Wonders of the World, The Great Barrier Reef. The Barrier Reef along with the many islands dotted around it are a massive tourist attraction to the area. Port Douglas has a huge variety of accommodation options from low cost back-packer hostels, 5 star hotels and boutique B&Bs. We stayed at The Sheraton as The Sheraton has a reputation for being very family friendly. The Sheraton rooms were quite dated when we stayed there (2014), however I’m aware they have more recently completed refurbishments which have apparently breathed new life into the property. The facilities at The Sheraton are excellent, especially for children. The large pool/lagoon provides a safe but beach style place for kids to play. There is also direct access onto the beach - some people swim at the beach, however it should be noted that crocodiles and dangerous jellyfish can be an unwanted hazard. The buffet breakfast at the Sheraton is excellent and whilst the restaurants are adequate, there are some really great options in Port Douglas that I would suggest. There is fitness centre and golf club associated with the Sheraton. Scuba Diving: If you don’t have your SCUBA certification, planning a holiday to Port Douglas, or anywhere along the Barrier Reef, is a great incentive to go and get it! 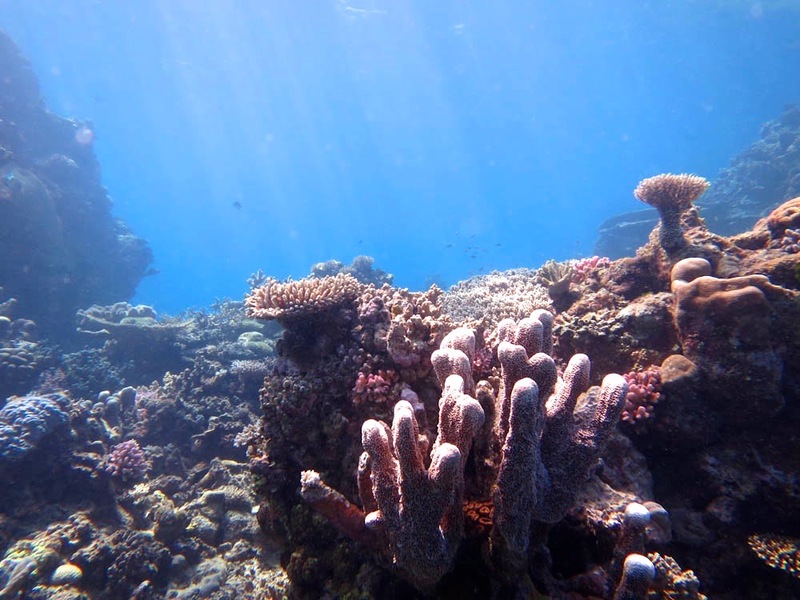 Its no secret that the reef has suffered due to human impact and whilst the diving is still excellent, it may not stay that way and they may look at further tightening up on access for tourists. We booked a days diving with Blue Dive. It was a full day out on the water with everything included. My wife and I had an instructor with us, which is something I always prefer when diving a new location. The large boat had many people including sightseers, snorkelers and experienced scuba divers – with a guide we felt totally looked after the entire time. Without a doubt, the most complete way to experience the reef is scuba diving. You can get a pretty good look at some of the shallower areas by snorkel and mask, but the underwater world opens up the further you go. This dive was the first time I had taken a recently purchased GoPro with me – I really enjoyed being able to capture what we were seeing. From talking to other divers and the instructor, it certainly sounded like the 2-3 day “live-a-board” dive tours that allow you to spend more time out there and visit more remote areas of the reef are the best way to scuba dive this area. We simply didn’t have the time, however it has been added to the list and would be well worth looking into if you want to spend more of your time diving. For people looking to experience the reef, but also have an amazing family experience, I strongly recommend chartering a yacht for the day. It is not a cheap exercise, however when spread across a family it can be economical and the experience was an absolute highlight for everyone in our group. The yacht took us all to an island where everyone could walk around, the children could paddle or experiment with snorkeling and the adults could snorkel deeper or simply relax in sun. We also snorkeled off the back of the anchored yacht with several reef sharks and giant trevally - an amazing experience. The crew provided a gourmet lunch and were a great help making sure all the children had a fun day. I think if you are visiting Port Douglas as a large group or family, definitely consider this! We booked through the same company that arranged our Scube Diving, Blue Dive and I couldn’t speak highly enough of how they managed everything from booking to helping the last person off the boat! Chilly’s Pizza – We had to wait a long time (was during peak holiday season) for our take away pizza, but it was worth it! Really great pizza – we actually went twice it was so good! LanternFish on Macrossan St serves really good fish and chips. I can definitely recommend the Moreton Bay Bugs! The Central Hotel does a pretty good chicken parmagianaand is great for large groups, including children. Its very much pub fare! They do a trivia night once a week, which was also pretty good fun. The Ironbar has cane toad races, live music and authentic Australian cuisine like kangaroo burgers. This is ok for a night out, but they only let you go to the toad races if you are having a meal…….and the steaks are not great! Salsa Bar and Grill – In my opinion the best place to eat in Port Douglas! It’s a little more expensive than some of the other restaurants and cafes, but the food is fantastic! Its really nicely set up as well, a really enjoyable meal for lunch or dinner! I had a kingfish dish which was amazing! 2 Fish Restaurant– The service here was quite slow and the food only ok. The menu didn’t have a great variety either. Pass. Lure Restaurant – Fantastic for an afternoon of tapas and drinks. Do great sharing dishes and pretty well priced. Fresh prawns – Can get fresh seafood directly from the fishermen at the harbor. Strongly recommend a bag of freshly cooked prawns to take home! Cheap and as good as a prawn will taste. We had a night family night at the hotel in the villa with a huge bag of fresh cooked prawns and take away fish and chips that was just superb! The restaurants at the Sheraton were quite pricey for dinner meals, so we chose to eat at the places in Port Douglas. Spend a day going out to an island. Whether it is as a young couple or a large family group, spending a day on a chartered boat; visiting a remote island, snorkeling with sea turtles and enjoying the ocean is amazing. There are a huge number of options and companies offering these services. Do your research and check the reviews carefully. We could not have recommended Blue Dive any higher. They were a touch more expensive but had much better reviews and they were worth every cent! If you are going to splurge a little on your family holiday to Port Douglas, spend it on this. The Great Barrier Reef is one of the 7 Wonders of the World. Whether its by air (helicopter flights take tourists out over the reef), snorkeling or scuba diving, being able to witness this massive living eco-system is incredible. If you haven’t got a PADI certification, try and get one before travelling to Port Douglas. Otherwise, you can do your course through companies there, (you will be limited on the depth you can dive). Port Douglas can be quite expensive and crowded during peak holiday seasons and especially during school holidays. If you don’t enjoy crowds, I would recommend avoiding these times. Conversely, if youre travelling with kids, the atmosphere during these times can be a real boost. Choose wisely depending on your situation. Great Barrier Reef - Sun - Fun. Consider insect repellant as a necessity, not an option. The sand flies and mosquitoes can be unrelenting! If you are looking for a beach holiday where you can sit on the beach and swim in the ocean, think twice. The beach at Port Douglas is often plagued with box jellyfish (painful stings), can have a strong under-toe and can be frequented by crocodiles. Swimming pools are recommended. The pool at the Sheraton is a large lagoon with beaches for kids to play.